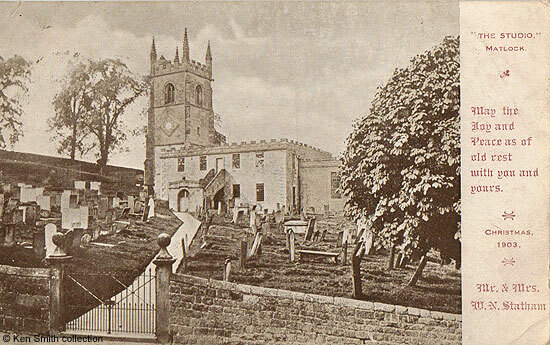 The Matlock photographer William Nathan Statham used this picture of Matlock's St. Giles' Church, taken in 1870, for the Christmas card that he and his wife sent out in 1903. Whilst the tower and the churchyard are unchanged the rest of the building looks somewhat different today. Shortly after the photograph was taken the church closed, the last service being held on New Year's Day, 1871. Funds to pay for the major building work that was planned had been raised by public subscription and Benjamin Wilson was appointed as the architect. He advertised for builders to work on the renovation and rebuilding project shortly before the closure. The church was to re-open later the same year and the first service in the rebuilt church was held on 25th October. According to Benjamin Bryan, all the seats in the new church were free and unappropriated, which was the opposite of what had previously occurred. Before 1871 there had not been an unappropriated seat in the entire church. There had been several attempts to alter or rebuild the parish church in the past. In 1783 Richard Arkwright had taken down the north aisle and rebuilt it, for example. Arkwright seems to have undertaken his alterations without the necessary permissions. In 1760 Peter Nightingale (junior) and others rebuilt the wall of the south aisle. Glover, Cox and Bryan all described the "little square factory-like windows of the south gallery" which can be seen in the photograph. They clearly disapproved of the pre-1870 design and layout. The south wall was "embattled on the top" and the porch door, too, did not escape criticism. It was "spacious but ill-designed, projecting several yards outside the south-west door, and on its east side adjoining the main flight of steps" to the south gallery, which could only be reached by these steps. Christmas Card posted in 1903 and sent to Mr. and Mrs. Frank Feargold, The Beehive. "The Derby Mercury", Wednesday, November 1, 1871. Reopening of St. Giles' Church, Matlock Town. "The Derby Mercury", Wednesday, November 30, 1870. There were at least three advertisements during November and December 1870 for builders to contact the Architect about rebuilding the nave of the Parish Church. Bryan was quoting a letter from Rev. W. R. Melville, the then Rector, about the seating. Melville's letter was published in "The Derbyshire Times" on 27 Apr 1872.